Walter Isaacson's "New York Times" bestselling biography of Albert Einstein is now available on audio for only .99 and will coincide with the hardcover and audio release of his next work, "Steve Jobs. "How did his mind work? What made him a genius? Isaacson's biography shows how his scientific imagination sprang from the rebellious nature of his personality. 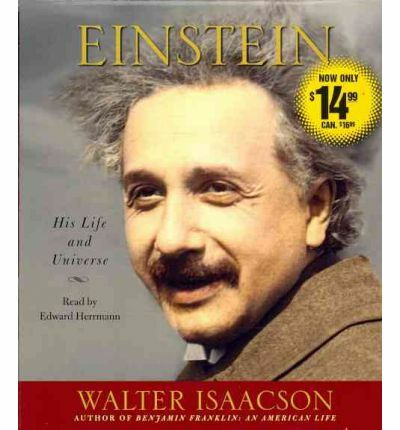 His fascinating story is a testament to the connection between creativity and freedom.Based on newly released personal letters of Einstein, this book explores how an imaginative, impertinent patent clerk--a struggling father in a difficult marriage who couldn't get a teaching job or a doctorate--became the mind reader of the creator of the cosmos, the locksmith of the mysteries of the atom and the universe. His success came from questioning conventional wisdom and marveling at mysteries that struck others as mundane. This led him to embrace a morality and politics based on respect for free minds, free spirits, and free individuals.These traits are just as vital for this new century of globalization, in which our success will depend on our creativity, as they were for the beginning of the last century, when Einstein helped usher in the modern age. About the Author: Walter Isaacson, the CEO of the Aspen Institute, has been chairman of CNN and the managing editor of Time magazine. He is the author of Benjamin Franklin: An American Life and of Kissinger: A Biography, and the coauthor of The Wise Men: Six Friends and the World They Made. He lives in Washington, D.C., with his wife and daughter. Edward Herrmann's numerous theater credits include Mrs. Warren's Profession, (Tony Award) The Philadelphia Story, Plenty, Love Letters, and an Obie Award for Outstanding Achievement In Theater. His films include Intolerable Cruelty, Welcome to Mooseport, The Aviator, The Cat's Meow, Reds, and The Purple Rose of Cairo. Mr. Herrmann received an Emmy Award for his work on The Practice, and appears regularly as Richard Gilmore in the hit W.B. series Gilmore Girls.